Using a heavy bag should be an integral part of your Muay Thai training. While many novice fighters often favor person-to-person sparring, a heavy bag can do so much to help you reach your full potential. It’ll play a key role in the overall conditioning of your body and help you perfect your fighting technique. One area in which a heavy bag can prove to be beneficial is combos. Learning how to initiate combos effectively can be difficult. The process gets tougher when you throw another person into the mix. It’s nearly impossible to learn the foundational skills and proper technique you need with a target that’s moving around a ring. A heavy bag will instill good fighting habits and help you develop the muscle memory you need to dominate any match. You’ll be able to focus on what your body is doing rather than following a target. Here are a few drills that can help you improve your combos. Do these exercises every time you train with a heavy bag to gain stamina, speed, and strength over time. This drill serves multiple purposes and can be used to hone a couple of different techniques at one time. When it comes to strengthening your combos, this exercise can make you more comfortable transitioning between punches and kicks. Over time, you’ll also learn how to change stances in an instant. Beyond that, this drill can do wonders for your overall stamina and endurance levels. Muay Thai fights can last for a long time. One of the biggest mistakes that newer fighters make is that they use up all of their energy within the first few minutes of the fight. This leaves them tired and vulnerable. This drill can build your stamina and teach you how to do sustained combos that will surprise your opponent. The main moves of this drill are simple jabs and roundhouse kicks. Start in your preferred fighting stance. Take a hard jab at the heavy bag with your forward side. Immediately transition to a roundhouse kick with the opposite leg. At this point, the combo is completed. You should then reset your stance to the opposite side. You’ll repeat this combo using the opposite hand and leg. To improve your technique, you should repeat this drill for as long as possible. The great thing about this simple technique is that each move sets you up for the next. For example, your jab pivots your body in the right position to make a roundhouse kick. The key is to get comfortable going through the motions. Over time, the combo will feel natural and you’ll get much faster. This exercise is designed to improve your flow from one move to the next. In a fighting match, you don’t have time to stop and think about what your body should be doing next. It needs to become second nature. Many skilled Muay Thai fighters take advantage of the position their body is in from one move to seamlessly transition to the next. This technique is extremely effective and can make it difficult for your opponent to keep up. Knowing when to shift your weight and how to rotate your body can make all the difference. This all needs to be done while you’re still maintaining the right fighting stance. While it may sound difficult at first, the exercise is relatively simple to get the hang of. First, approach the heavy bag and go into a fighting stance. You want to be facing the bag head on with your hands at about face level. Start off by throwing a jab. It doesn’t matter which hand you start with first. You’ll notice that when you punch the bag, your weight is shifted to the opposite side of your body. When this happens, throw another jab from the other hand. Again, your weight will shift back to the other side. Continue doing these punches while shifting your weight back and forth. When you’re ready, throw in a low kick at about waist height. You should kick with the leg that’s on the opposite side of the last punch. As an example, you could jab right, jab left, jab right, then kick left. As you’re resetting your foot, jab with the opposite hand and repeat the combo. Knowing how to effectively punch from both sides of your body is crucial. It’s not uncommon for fighters to develop more power and technique on their dominant side while neglecting to train their other side. To be successful, there’s needs to be an equal balance between the two. This drill strengthens your punches and kicks evenly. It can also teach you how to approach your target from both fighting stances. The unique thing about this particular exercise is that you start with one move and continue to add in new techniques until you’re finished with the circuit. You’ll perform each step for 30 seconds before adding another move in. Start by performing a double jab. Continue this for 30 seconds and add your right hand. Perform the double jab and right-hand combo for another 30 seconds. Then, throw in a switch left kick. Now the combo is a double jab, right-hand, and switch kick. After 30 seconds, add another right hand. Finally, introduce a left teep. The final combo should be: double jab, right-hand, switch left kick, right-hand, and left teep. The final drill should last for 60 seconds at least. At this point, you should switch your fighting stance to perform the entire drill with the opposite limbs. Doing this exercise every day will strengthen your punches and improve your confidence on both sides of your body. This is a bit trickier and may require more practice to master. However, once you get the hang of it, the combo can be used in a number of situations. The goal of this exercise is to help you master the transition from a long-range attack to a short-range one. It can also teach you how to keep your opponent within the appropriate range during a match. To do this, you’ll be performing roundhouse kicks and knee jabs. In addition to improving your speed, the drill can help master your kicking techniques so that you can stay stable. The position of your foot during a knee jab can make or break your stance. Even a small twist of your foot will cause you to lose your balance. You’ll start off by facing the heavy bag at a distance. Use a roundhouse kick to strike the bag. 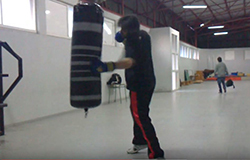 As you recoil your leg, touch the bag with your fist to stabilize it. Don’t let your foot touch the ground after the roundhouse kick. Instead, hold it up at a 90-degree angle as you stabilize the bag. Then, place your foot down ahead of the foot that has been on the ground the entire time. This motion does two things. First, it reverses your stance and positions your body to make a knee jab with the other leg. Secondly, it brings you closer to the bag so that you can complete an effective short-range attack. Perform this drill repeatedly until you get used to the transition. At that point, you should work up your speed to make it into one fluid combo. Make sure that you wait to speed things up until you can retain your balance each time. Muay Thai is full of surprises. This especially true when you’re fighting an opponent. You can never know when or how an opponent is going to strike until the moment just before it happens. You have to be prepared to defend yourself in an instant. This exercise is designed to teach you how to combine offensive moves and defensive moves. It’ll help you learn how to shift your priorities quickly. You’ll get more comfortable protecting yourself and develop the skills you need to make a counterattack that could surprise your opponent. To begin the combo, launch a jab attach at the heavy bag. Immediately follow that up with another jab. It can be from the same side or with the opposite. At this point, you should raise your leg to block your midsection from an imaginary kick. You should use the opposite leg to the side of your last strike. After a quick leg block, lower your foot back down and raise the other leg for another block. When you lower this leg, immediately launch a roundhouse kick. You should be using the same leg you just lowered. This fake-out counterattack will catch your opponent off guard and put you back on the offensive. Once you’ve completed this combo, switch sides and do it again. Repeat the exercise on both sides to pick up speed and strength. Regular drill training on a heavy bag can make a huge difference in the long run. You’ll be able to master your skills, improve your speed, and gain power before you even get to try them out on a live opponent.